Here in the Minneapolis area we look forward to the warm, sunny days of summer, but often that sunshine gets to be too much. When you have a bright sunny area on your deck or patio but nowhere that you can cool off, then you have probably are looking for options. 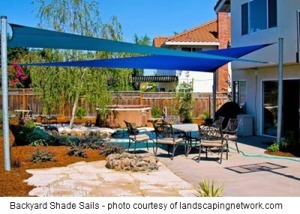 While traditional shaded areas might cost a bit, there are actually multiple ways that you can become even more creative, while saving a buck or two. This Old House presents a piece focused on some of the most creative ways that you can save some cash but also get the look and shade you desire in your yard. You never have to sit in the sun if you do not want to. With a little work and not too much expense you’re able to take control of the area and enjoy the space you have. Here at Architectural Landscape Design can help you achieve the look you’re after for your yard. In addition to the ideas in the post from TOH, we can suggest some creative landscaping as well, such as a gazebo or vine-covered arbor. Why not call us today for a free initial design consultation? As a licensed MN landscape design and installation contractor, we can can help you get the beautiful yard you’ve always wanted, complete with the shaded areas. Check out our latest Pinterest board for some more inspiration.